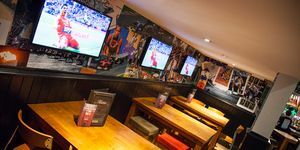 "The Dugout at Belushi’s Sports Bar in London Bridge is without doubt the home of international sports in London. 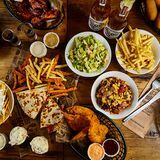 Looking for an epic sport bar to watch some sports, play some beer pong or just tuck into an awesome homemade burgers and beer, then the Dugout sports bar in London Bridge has got you covered. Football, Rugby Union, Rugby League Champion's League, Premier League, NFL, AFL, Basketball, NBA, Tennis, Cricket, the F1? 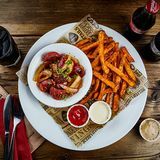 Whatever it is you are looking to watch, The Dugout screens all major international sports and they’re serving this up across new state of the art technology. 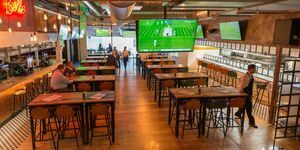 Expect the ultimate viewing experience as they screen every fixture across their many large 4k Ultra HD screens, complete with Sky Q and Dolby Atmos surround sound, offering dedicated table service throughout all fixtures. They offer a large selection of international bottled and draft beers, ciders, spirits, wine and cocktails, including their own Dugout lager - The Grand Slam. 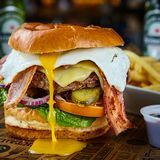 Don’t miss their We Happy Hours including £10 buckets of beers, £10 jugs of beer and cider, 2 for 1 on cocktails and £15 bottles of Prosecco as well as £10 sharers, all from 5-8pm Sunday to Friday! 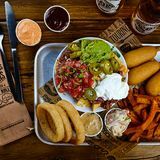 Famous for their home made burgers they also have a great lineup of main dishes including ribs, hot dogs and steaks plus a great selection of sharers and bar snacks. 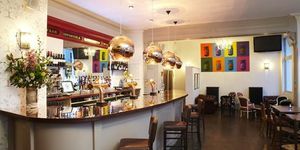 All served from Midday on weekend and 5pm until late during the week. Rally up your friends and book in a game of Beer Pong. Their great Beer Pong package includes everything you need as well as a free jug of beer to get you started. Looking for some VIP hospitality? Then check out their themed Caves available for private hire. The space comes complete with HD TV's and surround sound, fully stocked fridges, game consoles and all of the latest games, beer pong, their full food menu and more… Twitter @BelushisDugout Facebook TheBelushisDugout"
You can book to reserve an area of The Dugout at Belushi's for you and your friends. Just enter your requirements below to see what they have to offer. What did you think of The Dugout at Belushi's? Without doubt my new favourite sports bar in London! I visited The Dugout on Friday night with a group of friends, what an awesome bar with a great atmosphere - loads of other friendly groups, people mingling together - we had some EPIC games of beer pong and other games. The staff were super friendly and helpful - especially our waitress Jodie. We booked The Heineken cave, which I would recommend as it gave us our own base for the night. There are a couple of other themed caves to choose from, but the Heineken one is closest to the main bar area, so we were happy with our choice. We have already re-booked for the Anthony Joshua fight - The Dugout is without doubt my new favourite sports bar in London!